One word comes to mind upon first meeting Owner Broker, Valarie Bethel - effervescent. Her face lights up with a bright smile and her eyes sparkle as she extends her hand in greeting. Valarie Bethel is one of those people with the enviable gift of putting people instantly at ease and she is the genuine article. Raised in Minnesota, Valarie has resided in Washington since 1986, and began her career in Lakewood in 1988, as the Office Manager for Parkwood Property Management. In the 1980’s, Parkwood’s office was located at 91st & Bridgeport. In early 1990, the business moved to its current location (a neighbor to Lakewood Historical Society and Museum) in the Colonial Center. Along the way, Valarie earned professional real estate licenses and designations that not every property manager has, such as MPM (Master Property Manager) and RMP (Residential Management Professional) and when Billie Helland retired, Valarie took over the business. Landlord/Tenant laws change frequently, which is why it is important to have a certified property manager who stays current with the latest information for consumers. Property managers are invaluable when an unforeseen repair crops up, which they often will--and at the worst time, it seems. And they are often indispensable if a renter is late with the rent. In short, property managers save property owners many headaches. 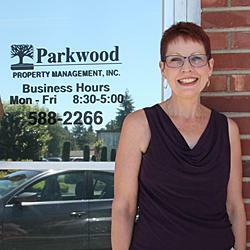 This autumn, Parkwood Property Management will mark its 26th year as a proud Lakewood business. Valarie and her expert two-person staff specialize in single family homes and smaller apartment complexes, with a current portfolio of about 300 properties from Fife to Dupont. Her staff understands how to serve both property owners and tenants with fairness. Property owners want qualified and responsible tenants and Parkwood has an excellent screening process in place for finding just the right renters. Valarie explains that getting that fit right is important: “Owning a rental property is like owning a business and has to be managed properly to have the best return.” By the same token for renters, “it is not just a rental property to them, it is their home for a time.” She adds that 30% of the properties Parkwood manages are owned by military families.